It seems somehow appropriate for a show in which everything appears illusory to have been written by an author who doesn’t exist. The trilogy of books for young people were co-authored by Louisa Young and her daughter Isabel writing under the name Zizou Corder and the resulting story, having been adapted for the stage by Marcello Dos Santos, has an immediate appeal for children and adults alike. 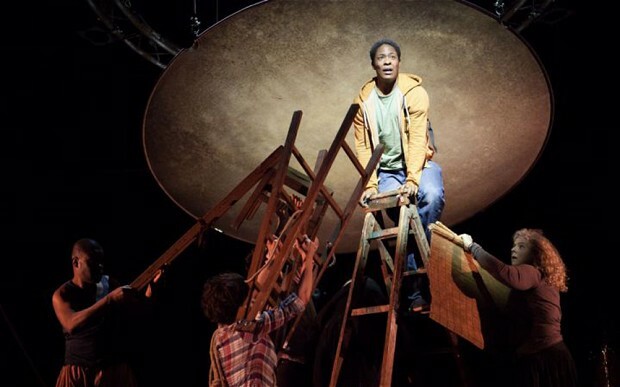 London-based Complicite are well known for their innovative style of theatre, and they always deliver storytelling that is brought very vividly to life. Here, in their first production aimed at a family audience, they do so with considerable flair and create a lively, fast-paced, engaging story. Adetomiwa Edun plays Charlie Ashanti, the Lionboy of the title, so called because of his ability to talk to cats. He also acts very much in the capacity of narrator, aided by his six fellow actors and an onstage musician. As the story goes Charlie, who lives sometime in the future, comes home one day to find his parents have gone. They have been kidnapped by “The Corporacy”, a pharmaceutical company who make their money by selling asthma medication. It seems that everyone suffers asthma due to a proliferation of genetically engineered, highly allergenic cats. Charlie’s parents are scientists on the verge of finding a cure for asthma, hence their disappearance. On his journey, Charlie joins a circus ship and meets a variety of weird and wonderful characters, including some circus lions who he befriends. This framework allows for a flight of imagination and some fantastical sets and costumes. The stage is designed in something like a big top layout, but the central, circular section of the roof of the set and the surrounding lighting gantry are mobile and enable various transformations, including a couple of very effective segments of shadow puppetry. The extensive musical soundtrack comprises a mixture of live and recorded sound, most of which is written and performed by Stephen Hiscock, who occupies a fair part of the stage area with his array of exotic percussion instruments. Adetomiwa Edun’s reputation goes before him, and it is hard to believe that he’s in his late 20s, as he plays the part of the 11 year old Charlie. His delivery of the text is superb and his cat-like movement as he depicts the conversations with lions delights the audience. He also shows that he can act standing on his head – literally. The rest of the cast are a well balanced and multi-talented team, best demonstrated in their performances as a circus troupe, including at one point an aerial performance by Lisa Kerr. Robert Gilbert, a graduate of Liverpool’s LIPA, is excellent in his fast talking part of Rafi Sadler, a scheming but lovable rogue of a character who ducks and dives his way through the tale, while Victoria Gould has the children booing and hissing with her portrayal as the evil Chief Executive of The Corporacy. Femi Elufowoju Jr, Clive Mendus and Dan Milne complete the line-up. Director Annabel Arden has performed a juggling act of her own in managing to get the story to tread a line that will appeal to audiences of all ages. The children in the theatre were captivated by the story, getting involved almost panto-style in booing and cheering at the twists of fortune, and screaming dutifully when wet “eels” are thrown out over their heads. Meanwhile there were equally as many grinning faces on the adults present, showing that the production works for everyone. Lionboy is a hugely entertaining night out for everyone. Adults without children shouldn’t be put off by the material; if you like having a smile on your face come and see it! Meanwhile, this is a tremendous introduction to the theatre for children. Don’t wait for the Panto to take your family out - get yourselves to a performance of this. Having opened at Bristol Old Vic and spent a week in Liverpool, Lionboy is touring via Oxford Playhouse, 11-15 June, Warwick Arts Centre, 18-20 June, West Yorkshire Playhouse, 25-29 June, Wales Millennium Centre, 3-6 July and Unicorn Theatre London, 9-21 July.